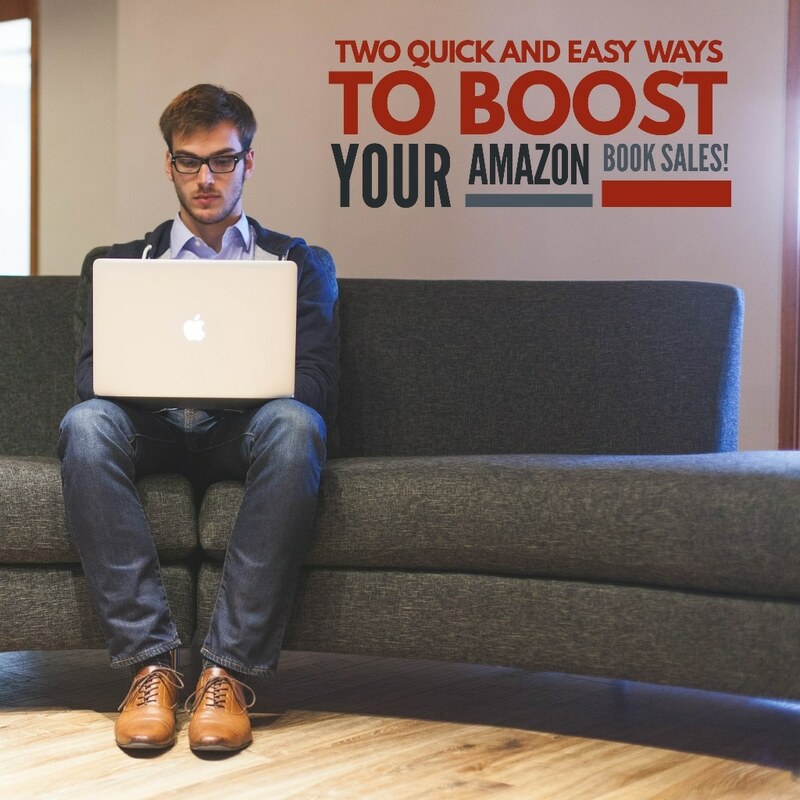 Today we’re going to show you two simple ways to make your Amazon page stand out. In a crowded marketplace you want to ensure you’re doing everything you can to make your sales page pop because someone else will be aiming to do it better. Worse, your potential customer clicked away, didn’t buy, which hurts your ranking. Let’s put a stop to this with two quick fix tips you can apply to all of your book’s pages. This is what it will look like on your page when the editorial reviews go live. It will show up just below your book description after whatever banners Amazon chooses to display. To create these editorial reviews for your book, you’ll access your author central profile here. Then add your book (if you haven’t already done so) and click on the book’s tab. Next click on the “edit” button near the “review” section. Add in around 5-10 good reviews using the formatting you see in the picture. Put the quote in quotations, bold the name, and space it out like I have it. You certainly can adjust your own formatting and experiment, but I find that this looks the best on Amazon’s actual sales page. Hit “preview” to see what it’s going to look like. If it looks good, then you’re good to go. But this is where it can get a bit tricky. The formatting can be tough to get just right for Amazon to save and render it properly. Stick with it and keep trying until it works. You can even try copy-pasting with ctrl+shift+v to maintain native formating from a Word doc and then redoing the formatting if it is being especially persnickety. And that’s it! In a few days editorial reviews will show up on your page and increase the overall professionalism of your book’s presentation and hopefully, more potential buyers will turn into actual readers. *Note: You’ll have to do this for both your Kindle and paperback versions of your book! This next trick isn’t overly complicated yet MOST authors on Amazon don’t do it! Many book descriptions are uploaded without special formatting, no attention to the header (the most important element), and the copy looks bland and likely doesn’t convert to its full potential. This step involves creating an engaging headline for your sales copy, and using HTML formatting. To get a great headline, think about what’s in it for the reader. Guess what? They are NOT reading your book description to find out what the book’s about. They are reading it to see what’s in it for them when they buy. They don’t care if the author has awards and recognition if it isn’t clear what’s in it for them. This is where we clarify the problem and BE the solution! Ask yourself why you would buy your own book? What does the reader have to gain from reading? What’s one quick win your book will give them? Utilize a tool like headline analyzer to create the perfect headline that will draw folks in and ultimately, sell the book. 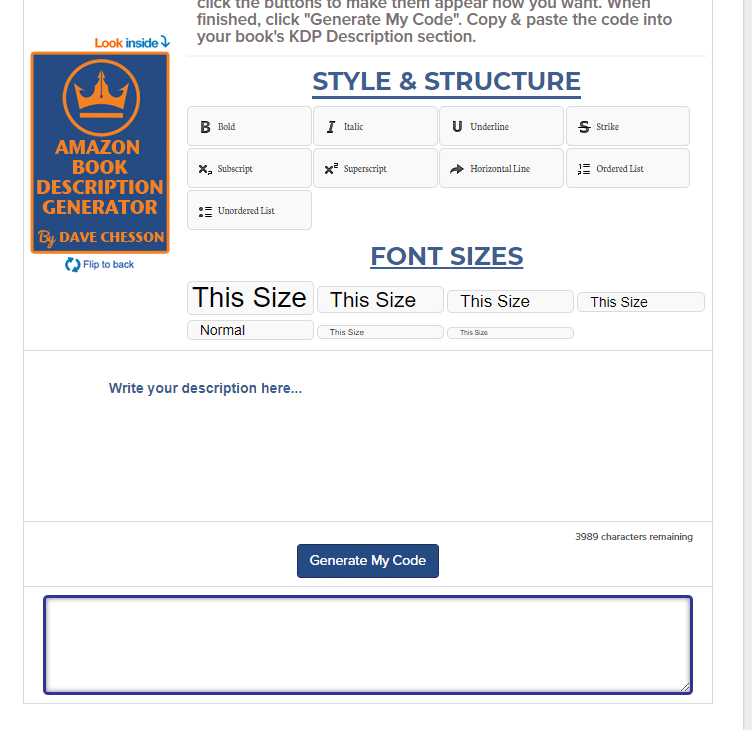 Once you have a headline down, go here to generate the HTML formatting you’ll be inputting into Amazon. Once you’re there, edit the text with bold, italics, lists and headers to really make it stand out. Once you have it all ready to go, click “generate my code” and copy paste that HTML text into your book’s sale description within KDP as seen below. And again, you must do this for both versions of your book (Kindle and print). The text won’t display as it should, and unfortunately. there is no way to preview the sales copy, but rest assured that it’s okay to paste the HTML there. Next, click “save” and scroll all the way to the end and re-publish your book to finalize the changes. Voila! You now have a sales page that’s better than 99% of the other pages out there. Congrats! Now the traffic you send to your book’s page is much more valuable. Good luck with your continued marketing efforts! Proper editing can often mean the difference between a good book and a great book. We offer three tiers of editing, depending on your needs: Developmental, line and copy editing. Proofreading ensures that your grammar is flawless and that there are no embarrassing typos or inconsistent tenses in your manuscript. It shows that you care enough to put in the extra effort, and sets you apart from the crowd. The cover of a book is the single most important element when it comes to selling your book. Our design team will create a fully customized and top quality book cover that will perform well in the market. When properly formatted, an eBook will look great regardless of the end user’s settings. We’ll format your finished manuscript so that it translates seamlessly across all viewing platforms and formats. Leveraging the power of on-demand printing, we’ll turn your finished manuscript into an attractive paperback that you can be proud to display on your bookshelf, at conventions or expos, or on the end-cap of your local coffee shop. Audiobooks are powerful but can often be technically challenging to create. We provide high quality narration, editing, mastering and production, as well as a promotional CD image and upload-ready audiobook cover for your manuscript. No time to write a book yourself? Our ghostwriting team has developed a custom writing process using an outline alongside recorded interviews, which we transcribe and transform into a manuscript that reads like a book in your voice.